With former EBU heavyweight champion and later official challenger Erkan Teper suspended for two years by the EBU (and one year by the BDB) and gone from the ratings the new OC for newly crowned EBU titleholder Robert Helenius is Dereck Chisora. EBU are now calling for purse offers with expiration January 21 at noon (Rome time). Helenius beat Chisora last 2011 on a close, controversial decision and injured his hand and shoulder in doing so and also began a long contractual dispute with Sauerland Event. 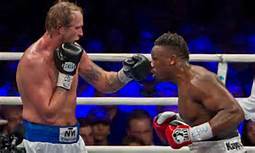 Chisora was then with Frank Warren but is now with Sauerland while Helenius is with Loudn'Live Promotions in Finland. The EBU had a busy day with purse bids for title fights at three different weightdivisions held – and all three attracted a lot of interest and decent paydays for the fighters. The biggest purse offered came from Gallego Prada Promociones that bid 63.121.00 Euro for EBU superfeather champ Juli Giner´s defence against Guillaume Frenois (39-1). EuroProm from France bid 55.000.00 Euro. The fight will go ahead in Barcelona in March of next year. Giner is 18-1-1. Three Italian promoters bid for the fight between 40+ welterweight veterans Gianluca Branco (49-3-1 and champ but inactive since November 2014) vs Leonardo Bundu (32-1-2). Boxe Loreni won with a bid 55.318.00 Euro, Roundzero came in second at 55.000.00 Euro and OPI 2000 third at 33.317.00 Euro. Date and site is to be announced. Finally, there were also three bids for the fight for the vacant EU superwelter title between Zakaria Attou (21-6-1) and Emanuele Della Rosa (36-2). OPI 2000 won with a bid for 17.717.00 Euro, Roundzero came in second at 16.000.00 and EuroProm third at 15.500.00. Date and site is to be announced.